I love the feeling of finishing a product! It gives me a great reason to shop my stash or go out and see what else is on the market. I honestly don't know if I want to buy skincare products in bulk to save money because I will grow so bored of using the same thing year after year. However.... I have diapers and formula to buy so hard reality may have to win out again. Regardless, here is a picture of the finished products for February. My crowning achievement here is the finality, sure as gone, doneness of the Kate Lorraine Collagen Vitamin Creme. This took me 2 years to finish. The reason I bought it was that it was made with placenta (bovine). At the time it was said that the nutrients from the placenta would help rejuvenate the elasticity of the skin. I don't know if it really worked or not but this cream was very moisturizing without feeling heavy. The other proud moment was finishing the Stila Lip Glaze in Kitten. Done, done, done! I'm currently not into lip glosses or glazes or anything of that texture because I can't kiss my kids when I have that stuff on. But in the interest of finishing stuff off I'm wearing this at work, at night when I sleep, and other times when I'm not with my kids. I also got a couple of samples out of the way. 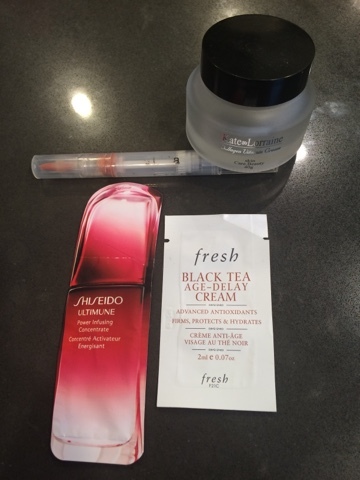 The Fresh Black Tea Age-Delay Cream felt nice. I could see myself spending money on it. Not sure if it will live up to its age-delaying claims but it sure did moisturize nicely. The other sample was some Shiseido serum. There was only enough product in it for one use so there's not much to tell. And that basically wraps this post up! I feel really happy about getting back into makeup and skincare, like I've got part of myself back again.